This is NOT what you want to happen when you press cider. Fortunately, this sorry outcome is very easy to avoid. Continue reading to learn the basics of making a proper "cheese" for pressing cider. 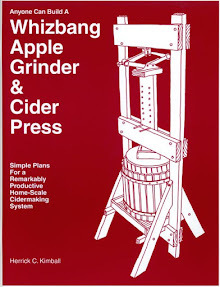 Rack-and-cloth pressing is the only cider pressing technique I recommend for the Whizbang cider press. 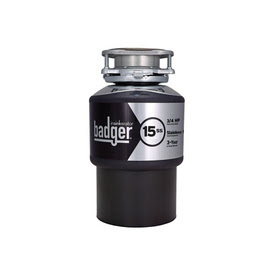 It is a more traditional method and results in more efficient cider extraction. 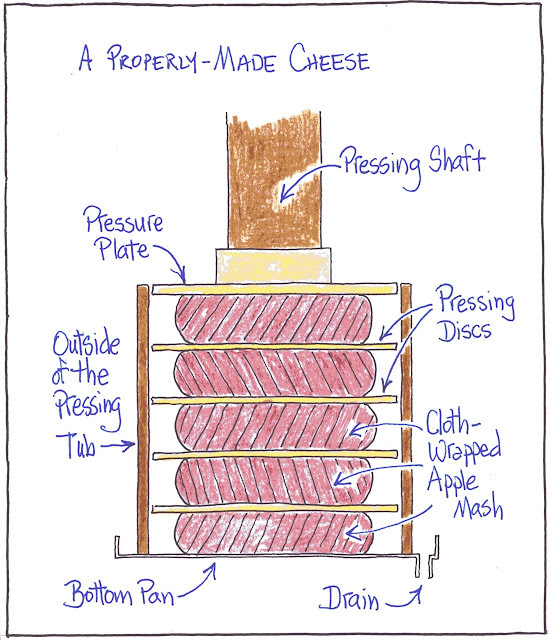 Also, if built properly, as I explain on pages 45 & 46 of the Whizbang Cider Plan Book, rack-and-cloth pressing does not put undue stress on the pressing tub with its HDPE hoops. A stack of cloth-wrapped, mash-filled "bags" layered between pressing discs (a.k.a., racks) is traditionally referred to as a cheese. 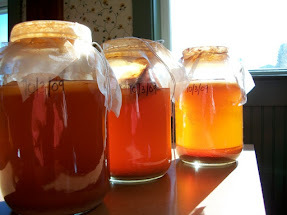 A friend and his family came over to my place to press cider last year (a good time was had by all). After building a couple of cheeses and pressing them, I let my friend and his kids take over. They quickly put the bags of mash and pressing discs into the tub and put pressure to the stack. 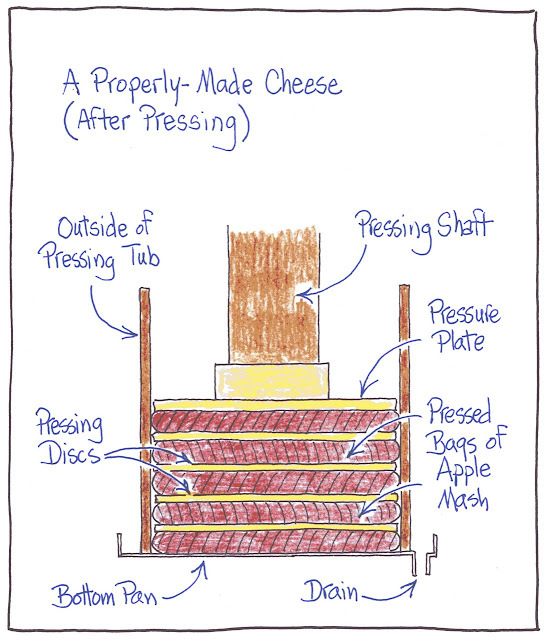 As the pressure was applied and increased I saw the pressing tub start to lean and distort, like shown in the drawing above. It wasn't a pretty picture. 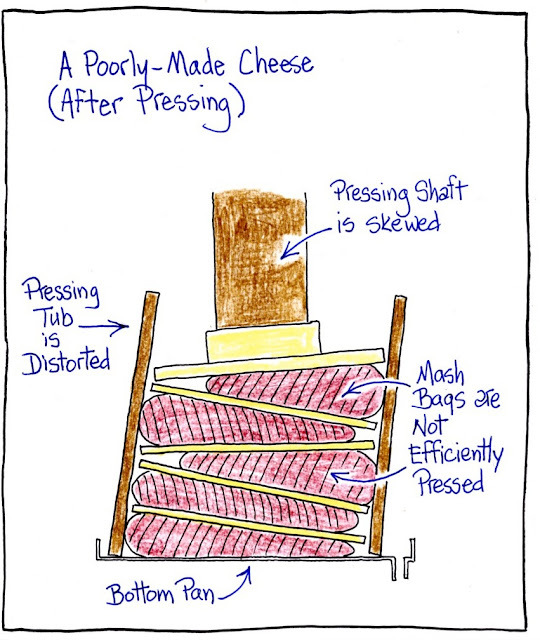 The cheese did not press quickly and efficiently, and I was concerned that the tub was going to be damaged. 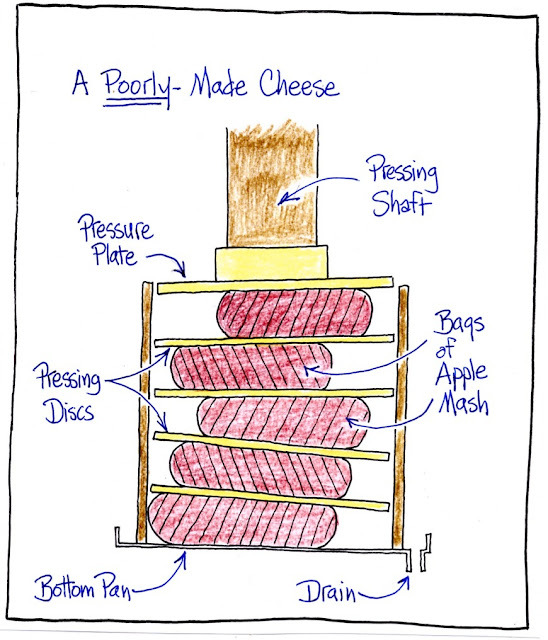 I realized that my friend had given little thought to building a balanced cheese. I guess I took it for granted that everyone would take the care I naturally took in building the cheese. But I shouldn't take such things for granted. 1. 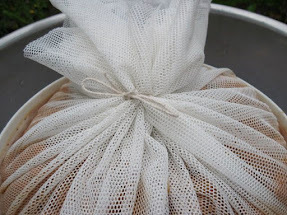 Don't overfill your mash bags. 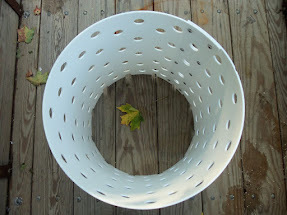 The 3"-high plastic-bucket-form I tell you how to make on page 45 of The Whizbang Cider Plan Book is just right (you can also see it in This Photo Tutorial). 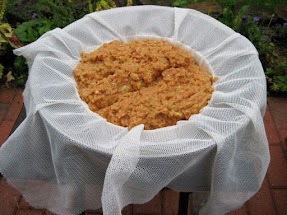 You can heap the apple mash a little in the form before wrapping it to make your bag, but don't overfill too much. It's counterproductive to do so. 2. Place (don't toss) your first bag of mash in the bottom of the tub, and center it. 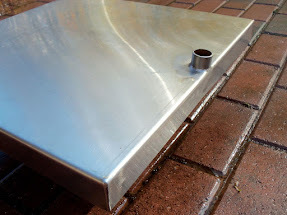 Place a pressing disc on top and pat it down onto the mash bag to compress the bag and then level the pressing disc. It doesn't have to be perfectly level—just level it by eye. 3. Continue layering mash bags and pressure plates by placing, centering, patting-down, and leveling each layer in the stack. 4. 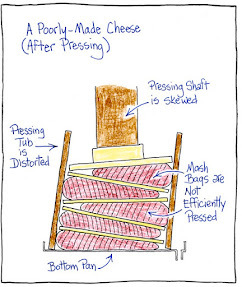 Before putting pressure to the cheese, adjust the tub of mash as needed to get it directly under the pressing shaft. 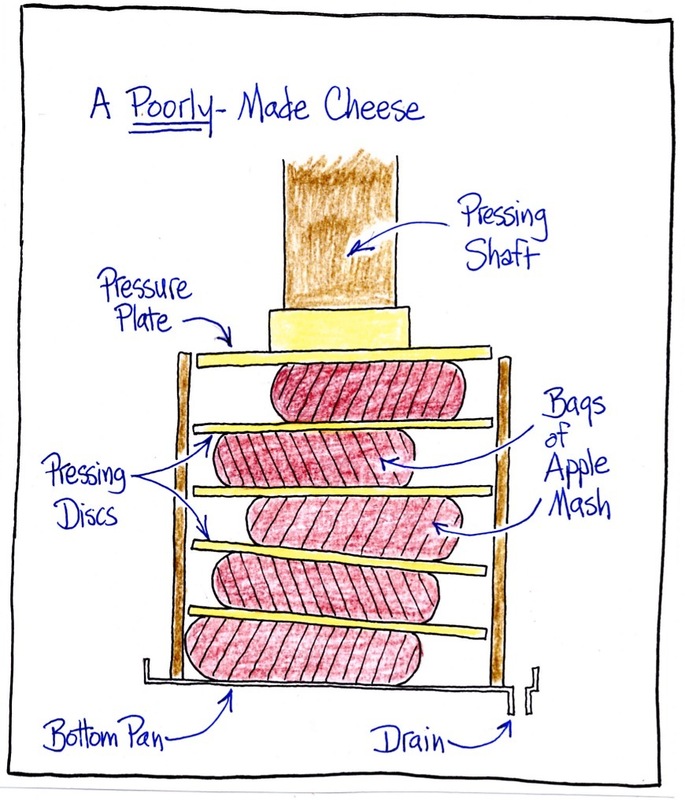 Now, for contrast, here is a poorly-made cider cheese. 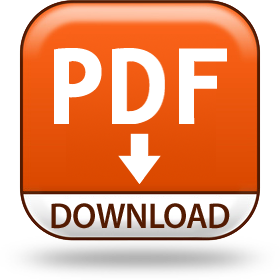 The bags of mash and pressing discs have not been placed, centered, patted-down, and leveled. Remember.... placed, centered, patted-down, and leveled. 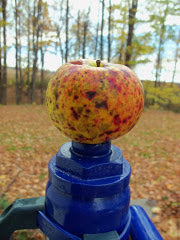 Now go have some fun making Whizbang cider!